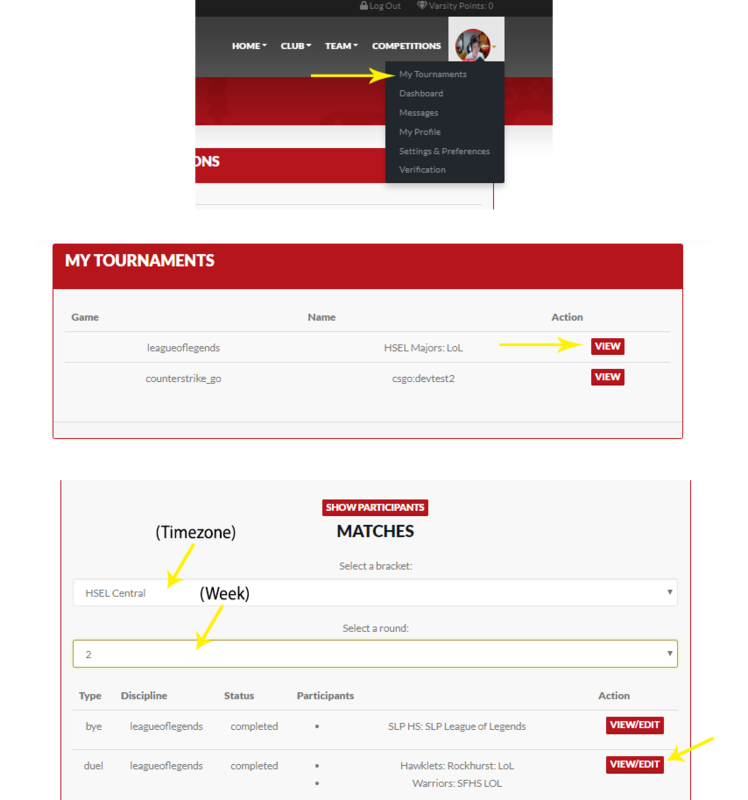 You can find your matches by clicking on your profile in the top right on Varsity Esports and selecting "My Tournaments" then selecting your tournament. Choose your bracket. Then select which round (week). Pro-tip: CTRL-F for your roster/club name. If they do not respond on Discord, search on their Varsity Esports Profile for their email. If there is still no response, try to reach out to their club adviser, then other club members /captains. We also launched a new feature called Match Chat! You can now message your opponent directly on Varsity Esports, on your match VIEW/EDIT page. Messages go directly to the other team! Try it today! Email info can be found after clicking VIEW/EDIT on your match. In the same place that you find and view your match, there will be reporting functionality. Scores should be reported right after the match. If there are any disputes, please fill out this form ASAP and provide as much proof as possible. It is good practice to screenshot match result screens.